What better summer fun than Schlitterbahn Beach Waterpark. Located just across from the KOA. Known for the best seafood buffet and island fun, Louie's Backyard has been pleasing the crowds now for over 30 years. Just across the Causeway bridge, be sure to visit the historic Port Isabel lighthouse, built in 1852. 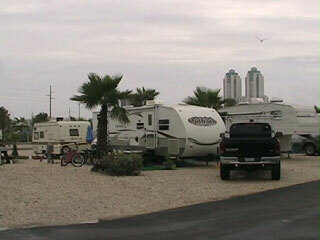 Situated by Laguna Madre Bay just a quarter mile south of the South Padre Island Queen Isabella Causeway, this palm tree lined bayside RV resort is a great base for exploring the island with family. The KOA provides a wide range of free activities for guests, from pier fishing, boat ramp access (if bringing your boat) sandcastle lessons every Saturday, swimming in a large pool, and aerobics/fitness classes. Fireworks light the bay area every Friday evening at 9:15 pm throughout the summer (till Labor Day). Just across the street within walking distance is Schlitterbahn Water Park. A free Island shuttle service stops at the RV park daily every 30 minutes. Adventurous? There is plenty to do here, ranging from parasailing, deep sea fishing, to the nightlife. 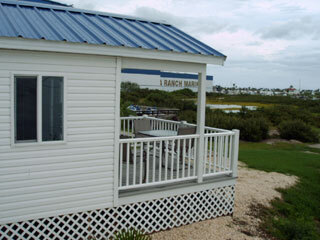 Located just behind the RV resort is a 700' fishing pier where guests can try their hand at fishing for free. We enjoyed watching a 6 year old catch a good sized sand trout off of the pier. Next to the pier is FishBone's Pier and Grill and Osprey Bay/Deep Sea Fishing Charters. The large swimming pool area is in a walled in enclosure for privacy, with lounge chairs, tables, and flowers lining the inside. A hot tub is situated in the inside corner. 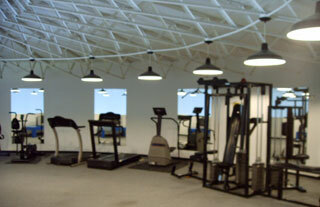 My wife enjoyed working out in the expansive fitness area in the upstairs recreation area (the Commons). Evening movies are shown on occasion downstairs, with a large TV, couch, chairs, pool table, video games, and Island information area. Housed within the Commons and Store buildings are also unique condos that can be rented. New to the KOA are three one bedroom, 2 full bath waterfront lodges, complete with a fully furnished kitchen and living room. 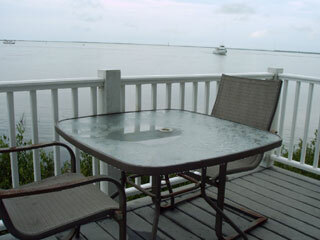 The front porch provides excellent views of the Laguna Madre Bay. Relax in a porch chair and unwind, and listen to the seagulls and waves. Dolphins are known to play near the shoreline. 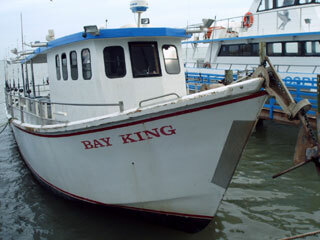 We enjoyed taking in an evening bay fishing tour on the Bay King (see above) with Osprey Charters. A discount is available to KOA park guests. Our catch included several sand trout and a whiting. The experienced crew directs the boat to the best fishing places to take advantage of the evening floor tide. You also get great views of the Bay area. Some of the other unusual fish we saw caught and released by those onboard that night were manta shrimp (big and dangerous), sea catfish, drum, octopus, squid, eel, and stingray. 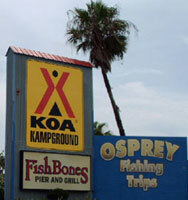 We would like to thank the KOA South Padre Island staff for assisting with our feature and accommodating us at their unique coastal RV park. Located at the first left after exiting the Port Isabella Causeway. North 26 degrees 6' 43"
West 97 degrees 10' 11"
The property where the KOA now resides was previously an ugly assortment of electrical lines, large water storage tanks, and dredged dirt from the building of the Causeway. In a monumental feat of land reclamation, the property was slowly transformed to become a top KOA resort. The 330 gallon water tanks and existing buildings were converted for use as the KOA store/office, the commons area (with fitness center, recreation rooms), condos, laundry, and bathrooms. A water storage facility was transformed into a large pool and hot tub.